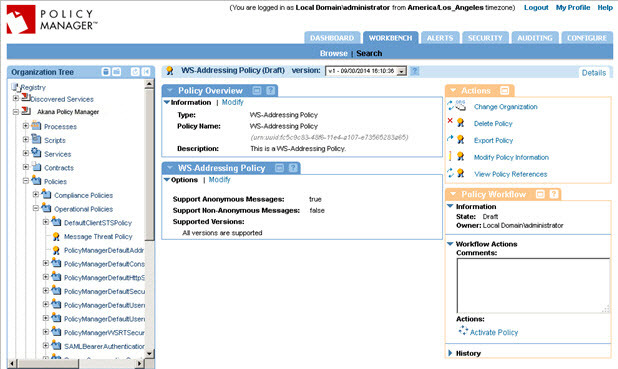 Learn about the WS-Addressing Policy and policy configuration options. The WS-Addressing Policy allows you to configure the type of SOAP response endpoints required for message processing. Two message types are supported: Anonymous and Non-Anonymous. Once you've created the policy, you can configure the policy options. Find the policy on the list and double-click to go to the Details page for the policy. An example is shown below. In the second section, click Modify to open the Modify wizard, as shown below. Specify values for the policy as needed. For information on the individual options, see WS-Addressing Policy Options below. That completes the policy configuration. You can now assign the policy to a service. The Modify WS-Addressing Policy wizard has only one page, Specify WS-Addressing Policy Options. It includes the options listed below. This option allows anonymous endpoints to initiate message exchanges and receive replies. It is used by endpoints that cannot have a stable, resolvable URI. Therefore, a Response cannot be sent separately to a response endpoint and must be returned synchronously in the body of the response to the input message. This option allows non-anonymous endpoints to initiate Message Exchanges and receive Replies. It is used by endpoints that have strict URI requirements based on selected WS-Addressing specifications. Response messages for IN-OUT exchanges will be sent to the specified endpoint. There will be no Body Content in the synchronous Response to the Input Message. Radio button options that allow you to select WS-Addressing specifications that are supported for the current WS-Addressing policy. Options include All and a list box that allows you to select specific WS-Addressing specifications.